One small piece of dark glass has changed my photography and how I see the world. Forever. Milky water and cloud movement in photos has always intrigued me. These elements give a somewhat dream-like effect to images, creating a unique contrast between static and dynamic subjects in a frame. Especially with seascapes the blurring of crashing waves and clouds really help in getting the viewer to focus on the main subject in an image, even if it’s something as simple as a single rock in a high tide. 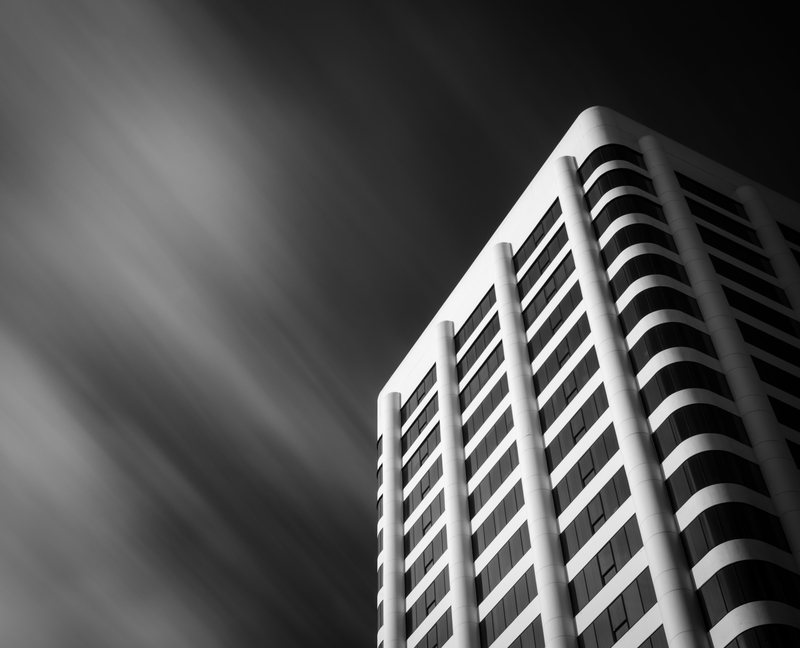 My most used tool to achieve these effects is the B+W 10 Stop ND Filter. It lives on my Nikkor 24-70mm/f2.8. 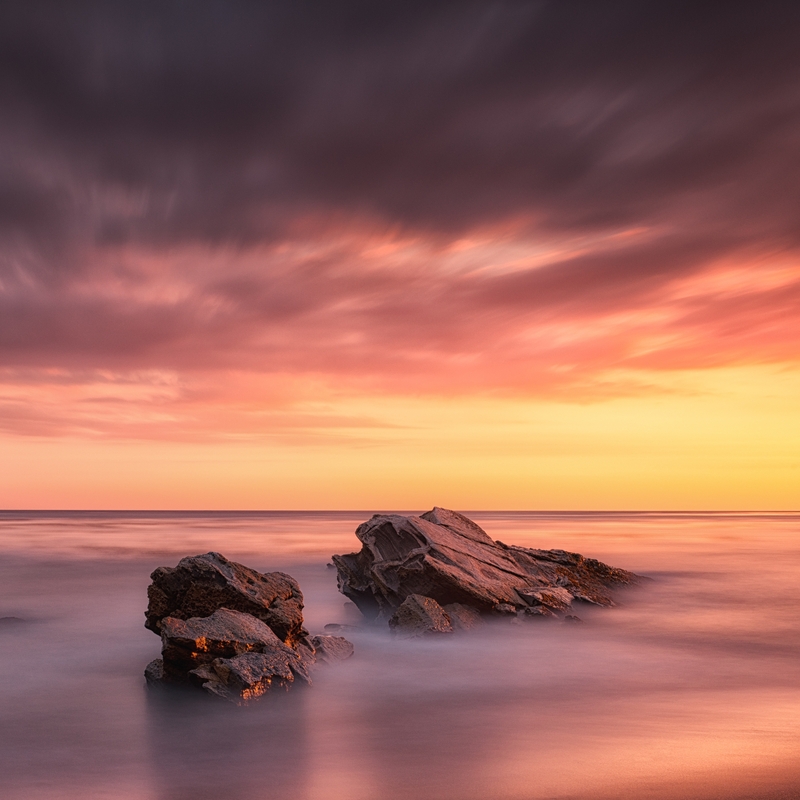 Perhaps the most popular 10 Stop is the “tough to come by” Lee Big Stopper and lots of big name photographers are now writing wonderful reviews on the new Hitech 10 Stop. As with so many types of photography a Graduated Neutral Density Filter is extremely important, most notably during the high contrast light of sunrises and sunsets. A good Grad ND will allow you to expose for the foreground without losing highlight details in the sky. With skies the effect of moving clouds can really add a ton of depth to a shot, and even more drama when the clouds are moving towards the camera. Clouds like these are the best, in my opinion, as they appear to be jumping right out the top of the frame. Long exposure work opens the doors for shooting at just about any time of day, and it has also made me appreciate fog and overcast days, especially when shooting for black and white transitions. Moody, minimal, black and white long exposures are some of my absolute favorite images, and my biggest inspiration in this discipline has come from Bay Area great, Steve Landeros. His unique take on the Golden Gate Bridge, the magnificent San Francisco architecture and subjects as simple as a single sea stack have taught me so much about composition, timing and post-processing. It’s an obsession. Once you get that first even exposure just right you’ll be hooked. You’ll start spending more time looking up at tall buildings, studying water patterns and on the whole, examining subjects you may not have ever noticed in the past. After a day of shooting in San Francisco’s Financial District my neck is sore. 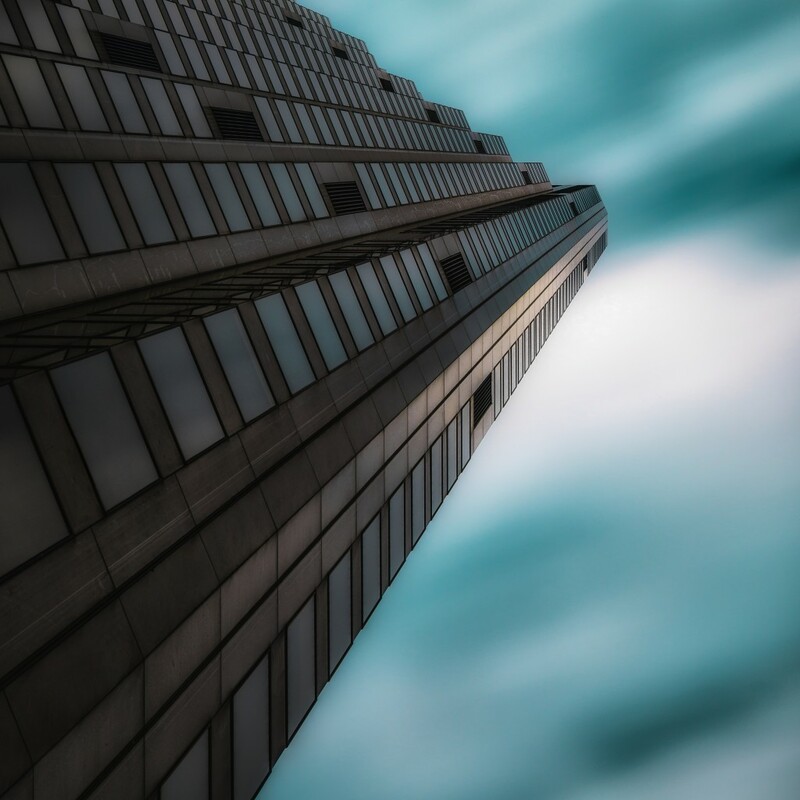 I’ll spend so much time walking around, looking straight up and trying to envision how the moving clouds will play off the structural lines of the buildings. Other than the surreal results, I love long exposures because they make me concentrate on my composition and exposure time much more than I otherwise would. Since a slight change in composition requires me to remove the filter, refocus and then re-attach the filter, I take less photos, but also leave a shoot with less throw-a-ways (at least by my standards). Less shots also means less opportunities to get the desired result. 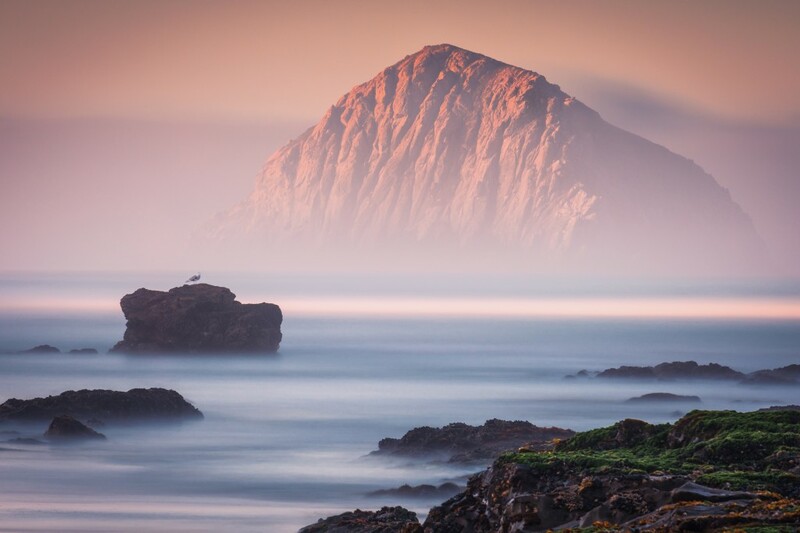 I recently shot a sunrise in Morro Bay and had maybe ten minutes of good light as the sun started to hit famous Morro Rock as it peaked through the fog. About two minutes into the good light I switched to my telephoto, set the timer for around three minutes and crossed my fingers the vibrant color would stay through most of the exposure. Long exposures require A LOT of patience as you’ll be waiting around for up to several minutes per shot. This gives me so much more time to sit back and enjoy the scenery. This is why I really love long exposures. I’m primarily a landscape photographer because this passion takes me to beautiful spots. Standing around watching a sunrise or sunset and only having to occasionally be bothered to press a button lets me focus on what it’s all about: appreciating our planet’s gorgeous natural wonders. And the most important thing to consider for getting into long exposure photography: A very sturdy tripod. Some of the best conditions for the most dramatic results occur during harsh weather and blustering winds. This is why I’ve opted for the Really Right Stuff TVC-33 Tripod and BH-55 LR Ballhead, even though my largest lens is a 70-200mm/f2.8. I know that in these windy settings I can walk away from the tripod, keep my shutter open for several minutes and still end up with a tack-sharp photograph. Article and Images by Mark Gvazdinskas of Silent G Photography, based here in San Luis Obispo, CA. Thank you very much, John! Have fun shooting and I’d love to see some of your work! These are 2 photos I made recently. These are brilliant, John!! Good choice going black and white, too. Thanks so much for sharing. Your welcome! I started following your work on Facebook and will keep an eye on your work. Great article and really good work. Would have appreciated a notation of the camera settings for each photograph. Regards. I really appreciate it, David! The Santa Monica architecture shot was with a Nikon D7000, and the rest were with my newer D800. The split-toned 555 California was only 30 seconds at f9, ISO 50. Santa Monica was f/14, ISO 100, 93 seconds. 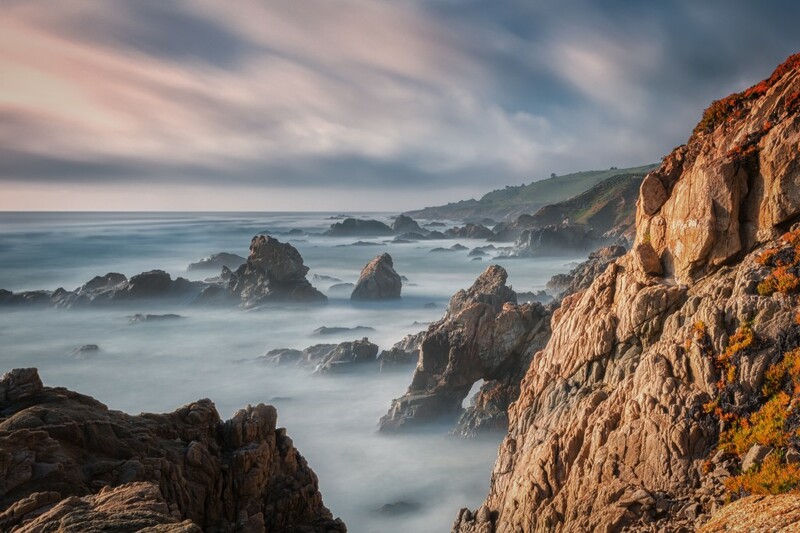 The seascape shots were all in the 3-4 minute range, all ISO 50, and f16-f18. Let me know if you want any more specifics–I’m always willing to share! My email is mark@reallyrightstuff.com. Thanks again. 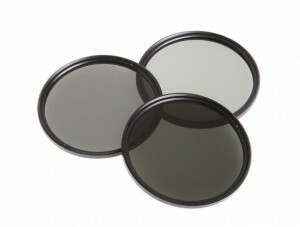 Hi Mark, thanks for the article on big-stop ND filters. I’ve been very keen on this type of photography for several years now. Recently, on my first trip to California (from Canada) earlier this year, I got some great results in the San Diego area with the ocean, one of my keeper shots of the trip being a dreamy seascape with a long pier and lots of cloud on a sunny day (which resulted in my travel-tripod RRS set-up putting its feet in the Pacific for the first time, which follows baptisms in water for that tripod’s feet for sea shots from Europe and the Asian continent). I have a lot of people ask me about my photos and how I get certain results, especially daytime timed exposures with ND filters (folks often accuse me of photo-shopping the results, which is just not the case). I explain that tripods are key for so much of my work, and so much so for daytime timed exposures using ND filters or, one of my favorites, infra red filters. Anyways, thanks for the article. As a photographer, I cannot get over the learning curves I’ve climbed over the years. Each new “specialty” (i.e. long-lens wildlife vs portraiture vs sports vs daytime timed exposures) I work into opens a world of learning. People who like the results of 10-stop daytime photography should know that it all begins with a great tripod and head system. And then the filters, shutter release cables, etc. And finding the right setting and situation (sunny day with lots of wind for the clouds to move and create sky features). And on it goes. But my camera starts it work for these types of images on its RRS TVL 34 and BH-55 because the *key* for 10-stop photography is to have static objects in the image absolutely tack-sharp, so the contrast between still and blur is all the more exaggerated. Thanks a ton, Chris! I’ve seen some of your work, including the pier shot, on Flickr and LOVE your photography. And thanks so much for helping solidify the importance of that sturdy tripod. While I love our lighter-weight tripods I have a tough time using anything smaller than my TVC-33, and really wish that TVC-34L was in production when I bought my 33 a couple years back! Enjoy the gear, keep up the fantastic work and let me know if you ever need anything at all! Thanks for the kind words, Mark. I scored a 10-stop Hitech recently for $45 new, so I figured, even if it has a color cast, at $45 its worth a try. I currently use Singh Ray’s Varin ND coupled with their 5 stop Mor Slo to get 13 stops. I plan to use the 10-stop and the Mor-Slo for 15 stops, and see how it works out. The longest daytime exposures without a doubt however, are with a true infra red filter. You get similar sky-scapes of clouds that look like pulled taffy, but its in that ethereal, Stygian state when you shoot in monochrome using your infra red filter. Very long exposures, even on the sunniest of days, steady tripod essential! This is where I almost always use the hook on the center column to take a weight to really steady off the tripod. I never hang bags from the hook, because in wind your ballast will swing and so will your tripod! I use a bungee to hang the weight in such a fashion that it pulls down and provides stability, but at the same time, it rests on the ground so it can’t sway. Let me know if you want to see some of the IR shots. They’re very cool in my opinion. Not everyone likes that style though. Thanks so much for the kind words, Hillary! I’ve followed your work for some time and I’m honored you took the time to leave a comment here. Have a great week! Superb writeup, Mark! Even though I focus mostly in wildlife, now I really want to try some landscape photography with 10-stop! Love your shots especially the clouds. Thank you! Tin Man Lee, you’re a wildlife master! I can only imagine how impressive your long exposure work would be. Thanks for stopping by! Excellent article Mark. i’m working on perfecting my long exposure photography. Thank you very much, Edith! I do have a list of recommendations I’ve been working on for your trip–I’ll have those to you by day’s end. Awesome article! Great info and well written. I got my first variable nd a couple months ago and have enjoyed trying to make it work. You pics keep me stoked on trying! Next time you’re doing a sunrise in mb, I’d love to join. I’m glad you like the article, Jason, and I’d love to get together to do some shooting! Shoot me an email at mark@reallyrightstuff.com and we can get something on the books. Take care. Great work, Mark and nice write up. Thank you. Joe Sr.
Nice work, I especially like the architectural work. I’m landlocked at the moment and would like to head more in that direction. I’ve got a B&W 10 stop but very red colour cast and I’m still trying to figure out how to get rid of it. I’m hoping for a Lee Big Stopper to appear soon. Thanks you very much, Mick, and my apologies for such a delayed response. I’m in the middle of working on a post from my recent Colorado trip…as landlocked as it gets. Nearly all of my landscapes (except for night shots) used the 10 stop. Have to love those afternoon thunderheads in the Rockies! Out of curiosity what camera body are you using with your 10 stop? I get a slight color cast but nothing that can’t be taken care of in post. Take care and thanks again! Thanks for the response Mark. I’m currently using a Canon 40D. I hope to get a 5D Mk3 soon, but that may still be a year off. I have the B+W 10 Stop ND Filter as well and it’s amazing. It is a versatile piece of equipment in my camera bag. I never go anywhere without it. It definitely has broaden my imagination as to what I can capture etc. I love to hear the JC! The b+w version is not only versatile, but it’s ROBUST. I’ve had mine for the last couple years, and you know how screw-on filters can be… I’m embarrassed to admit I’ve dropped it a few times and it’s still in perfect condition! I’d love to see some of your work with the 10 Stop if you’d be interested in sharing. Have a great rest of the week.